will held in Cargèse (Corsica - France) from the 20-24 of May 2019. 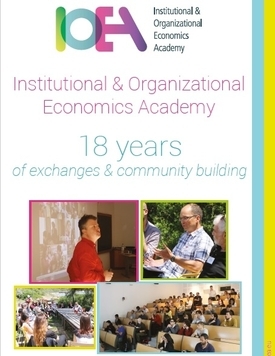 In eighteen years of existence, the Institutional and Organizational Economics Academy (IOEA) has become one of the most prominent events in research on institutional and organizational economics. Over the years, IOEA has continually built up a dense and wide network of researchers and students interested in this dynamic field. The strong mobilization of scholars, the organization of complementary workshops and joint publications, the development of on-line resources, the benefit of well-suited facilities, the support of renowned universities, the reiterated financial support from numerous noteworthy institutions and the positive signal that these supports gives to researchers have all contributed to a long-term success. Today more than 350 alumni currently hold academic positions throughout the world, and many scientific co-operations were initiated in this framework.